On my latest junkin’ adventure I found a vintage chandelier with crystals. I like the size of the chandelier. 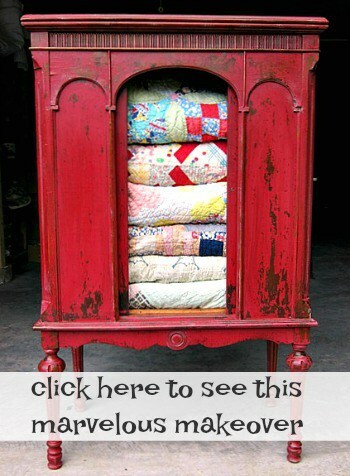 It’s small and I think I can hang it on the shabby chic floor lamp stand I found a few junkin’ trips ago. I would like to wire it up so it works. Never worked with wiring before. We’ll see what happens. I bet the JTS can help me figure it out. I paid $15 for the fixture and I only have 4 crystals for the top part of the light. How about the perfectly rusty headboard and footboard. I paid $5 for them and don’t have a plan yet except for brushing them off and wiping on a couple of coats of clear wax. I bought the chest of drawers for $20. The chest needed some work and the JTS has already taken care of that. 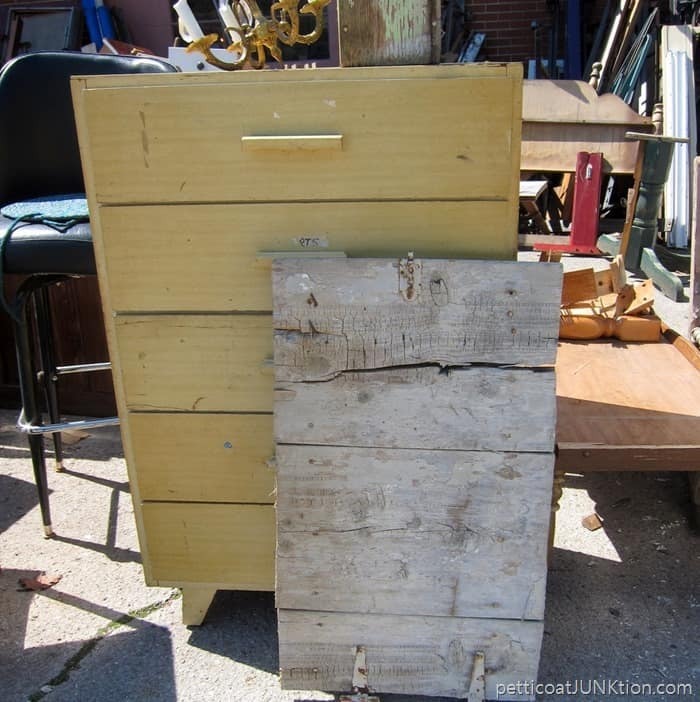 The rustic door panel came home with me too…..$5. Maybe take apart and make signs or leave it as is for a very rustic table top. 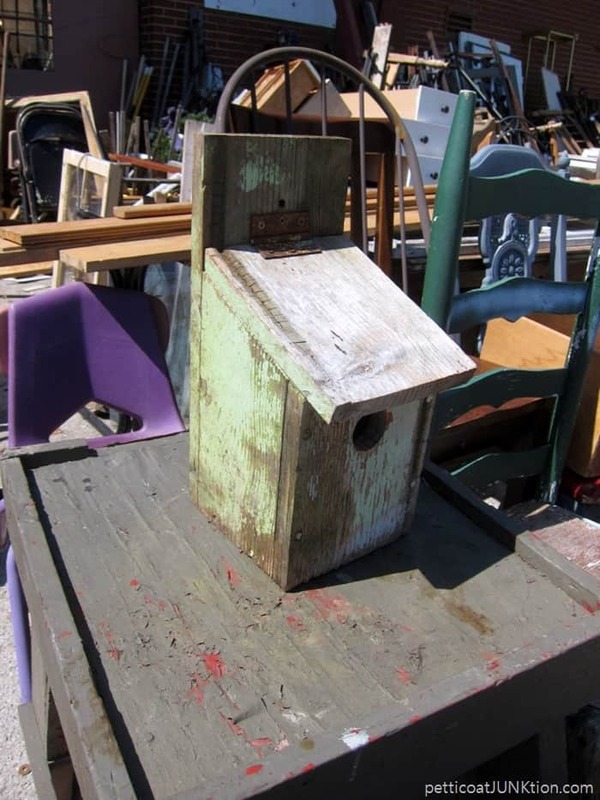 Isn’t the birdhouse just perfect. I asked Mr. Butler for the price and he said $5. I snapped it up. He quoted the same price to someone earlier in the day and they looked at him like he was nuts. You can’t have everything for free. More hardware for me. I may be at my limit on furniture pulls. Nah. The stool came from the Goodwill in Hopkinsville. I usually make a stop there on the way to the junk shop. At $7.99 it wasn’t a bad deal and I’ve already perked it up. Hoping to share the makeover with you this week. That’s it! What do you think of my purchases? Which is your favorite? Leave me a note and have a great day! 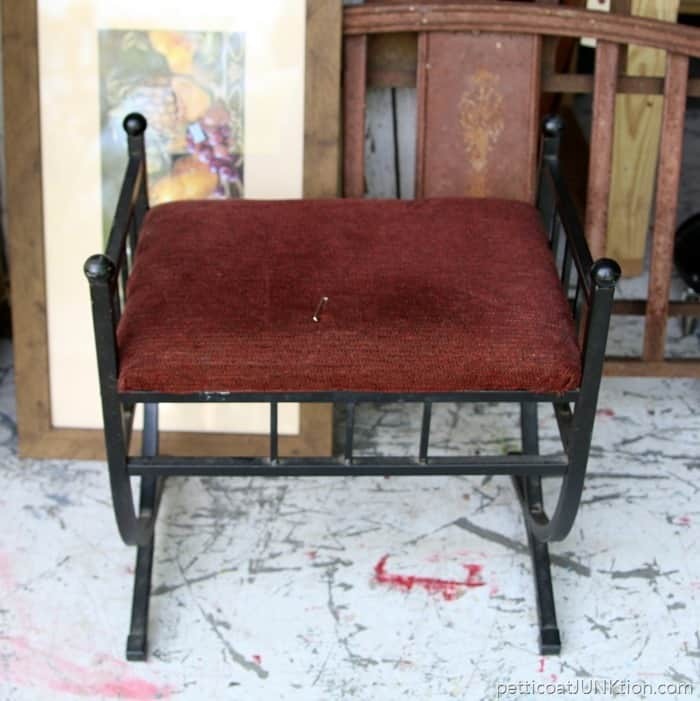 Love the little stool – the metal is unusual. 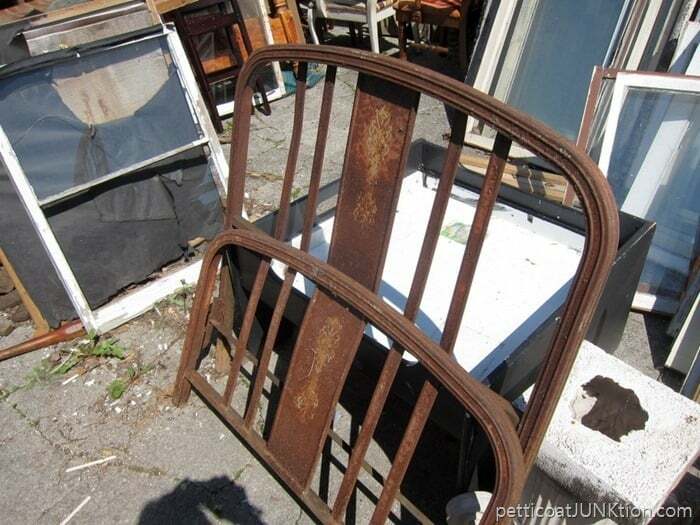 Also, the rusty bed frame – you had me at rusty! I love old chandeliers. The chest is a great piece. You found a lot of good stuff. Kathy, I recently found a chandelier myself. It was missing 8 crystals and needed to be rewired. I can not tell the difference between mine and the one you found. I paid 25.00 for mine, something like 20.00 for missing crystals and 50.00 to have it rewired-all those arms. 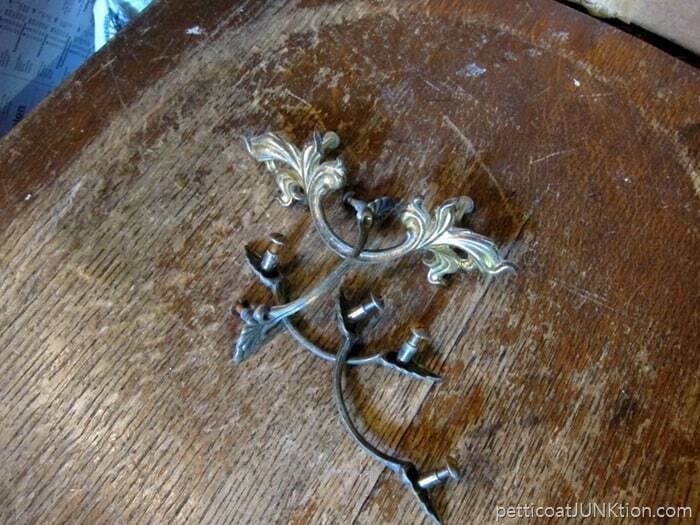 Mine was cast bronze as I think yours is and I sold mine within 3 weeks for 195.00 in the shop. I doubled my money and someone got a pretty chandelier for their home. I have rewired many table lamps and floor lamps but all those arms! I want to leave the comment that you shouldn’t pull the wires out until you tape the new wire to the old and pull it through. A coffee table top, that is. Some great finds. I say use the old door for a table top. You’ll laugh at this, Kathy, but my favorite is the birdhouse! Next down is the iron bed, but that looks like a big job to get it looking nice. I sure would love to shop at that junk shop, though! You find some good stuff. This was a very good haul! Can’t wait to see the transformations. Looks like you have quite a few projects ahead of you! Wow! Wish I could find a chandelier to redo! 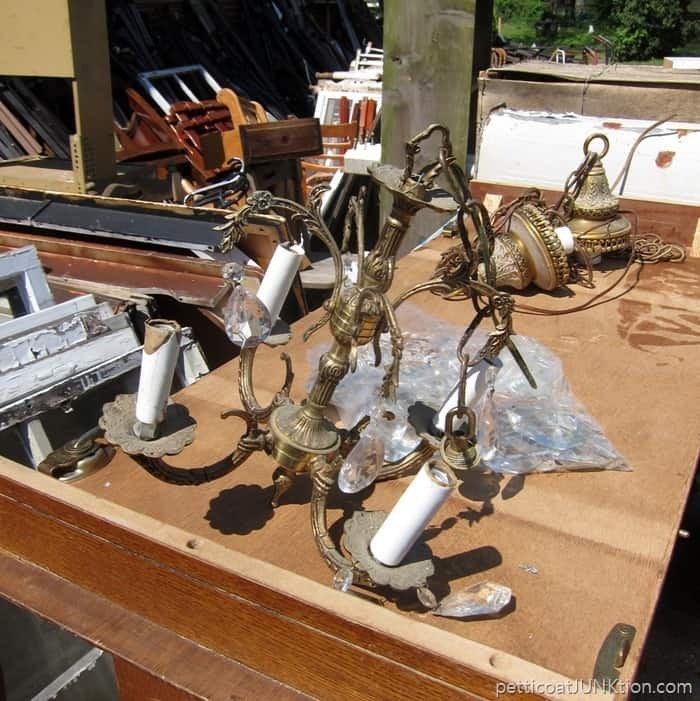 I have had an idea in my mind for about 3-5 years for a chandelier but need some “good bones” to get it started! I would love to go shopping in your collection of treasures! Give me a 5 minute time limit and let,me go! LOL have a great week! I just love the rusty headboard. I believe there is something you can buy called a rust neutralizer so that the rust doesn’t get on your hands and linens. I also love the chandelier , Love your posts way out here in Cali. 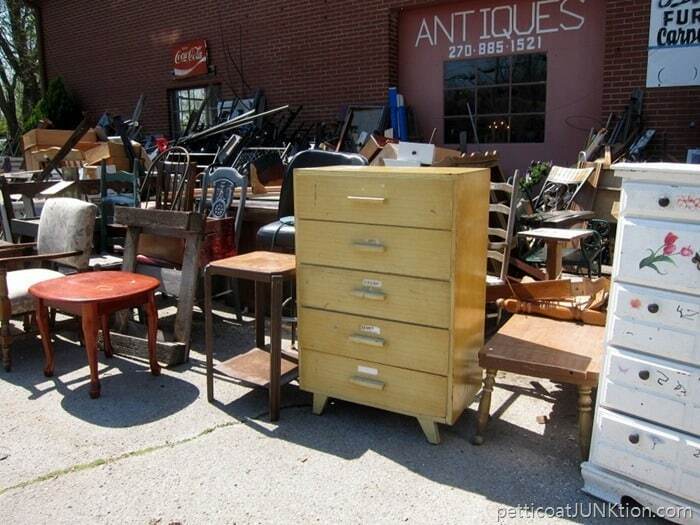 Wish I could go to the junk shops with you love them,,,,you could say I am addicted……. I don’t know if I can pick a favorite. Can’t wait to see what you do with all of them. The chandelier attached to the lamp stand does sound amazing. You always find the best stuff. Wish I had a store like that near me. My favorite is the chest of drawers. Wow! Love the light fixture! 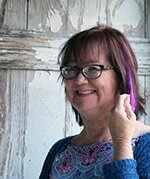 Great finds for great prices – lucky lady! Can’t wait to see what you do with them! Love that chest, Kathy. Can’t wait to see what you’re going to do to it. I like the footstool a lot. I haven’t seen many with all that metal (wrought iron) on them. I’m thinking you might put a cushion on top of it ??? Looks like you found some treasures. Me and my sisters are going thrifting tomorrow. We go once a month and enjoy not only thrifting but also spending time together.